The jazz musician Charles Mingus was a celebrated band leader and one of the most important composers of his generation. But at the same time he was recording The Greatest Jazz Concert Ever with Dizzy Gillespie and Charlie Parker, he was working on another masterpiece of sorts. He figured out how to get his cat, Nightlife, to poop in a toilet --- and he decided he'd share his method with the world. Mingus biographer Gene Santoro says there's something about Mingus' obsessive detail in the CAT-alog that connects to his composition. His bands improvised, but Mingus "was writing the music for the heads, and the themes," he explains. "He was attempting to notate, down to the breath control, exactly what each note in those themes would be for every instrumentalist. And this is the period we're talking about where this [toilet training method] gets generated." Reporter Jody Avirganput the method to the test on four-month-old kitten Dizzy. His owners, Kevinand Nicole, even played Mingus throughout the process. 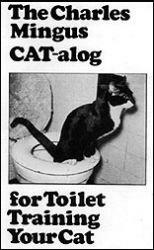 Have you toilet-trained your cat using the Mingus Method or any other system? Tell us about your experience in a comment below --- or by e-mail.